Great comeback win by Varsity today against a tough Saugus team 2-1. F/S also tied Saugus 0-0. 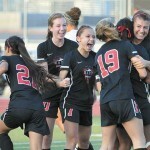 Next up is Golden Valley at Hart on Friday 2/3/2012 at 3:15 PM.